Confident it works but I can't get the pendulam back on. 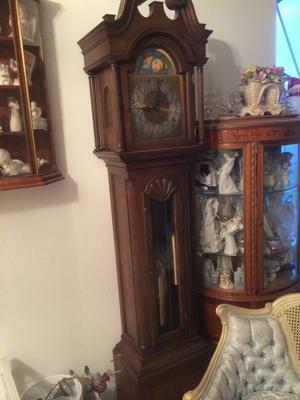 This clock is circa 1980, I have the same one that my grandfather bought my grandma in 1980 and had it inscribed brand new. I also just had mine services to fix the pendulum and time mechanism and clock guy confirmed it as Colonial Clock Co. Model 1683 for me. Just in case you were open to a little extra info.